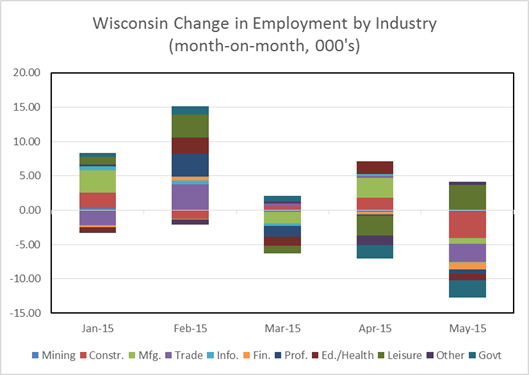 Today, Wisconsin’s Department of Workforce Development released monthly estimates (in addition to the QCEW figures discussed in this post). 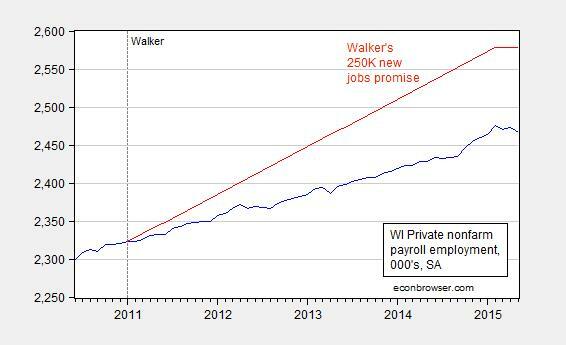 Figure 2: Wisconsin private nonfarm payroll employment, 000’s, seasonally adjusted (blue), and trend consistent with Governor Walker’s August 2013 promise to create 250,000 net new jobs by end of first term (red). Source: WI DWD and author’s calculations. Note that April figures were revised downward; total and private were revised down 3600 and 3400 respectively. Since the employment figures are based on surveys, I would take the last eight months of data with a grain of salt. However, a downward trend over the last three observations suggests at a minimum some sort of slowdown. Update, 6/23 9am Pacific: Here is a decomposition of changes in employment, by industry. Figure 3: Month-on-month change in employment by industry, in 000’s. Source: BLS and author’s calculations. One interesting aspect is that trade, transportation and utilities accounts for a noticeable share of the May employment decrease. On the other hand, manufacturing does not account for a large share, suggesting the strength of the dollar is not central to the Wisconsin story. This entry was posted on June 18, 2015 by Menzie Chinn. I would have suggested that this might be in part a return to normalcy: the monthly figures overstated not-seasonally-adjusted nonfarm payroll growth in 2014Q4 by about 10,000. But in this case the drop is closely matched by the drop in employment in the household survey. 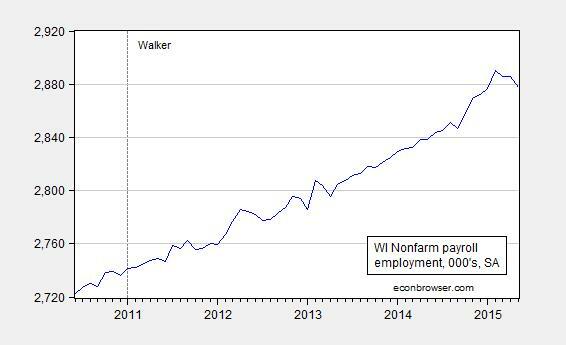 Employment in Walker’s Wisconsin is turning into the least of our worries. Looks like Wisconsin hits 250,000 new jobs in early 2020. But then the GOP doesn’t really care about jobs anyway, so it’s all good. LOL! You have it wrong. The GOP doesn’t care about paying people not to work. It has been said that you can have all the unemployment you are willing to pay for. Why do we need immigrants to do work in the US? Is it really because US citizens won’t do the work? Actually yes, they can make more not working at menial jobs than working. We pay people not to work. What a great country! Charles Rist pointed this out to the UK long ago but they did not listen. His words are still echoing around us but no one will listen. are they paid us wages, or are they paid latin american wages in the usa? are you willing to work in a strawberry field for 12 hours a day for minimum wage? why should you expect somebody else to? the market system is broken in this area. another area where the market system is broken, CEO pay. why is a ceo such as immelt or dimon paid millions? does anybody really believe they are that valuable to a company? again, the market system is broken. look at how much buffet makes in salary to run berkshire. the weird thing is, the poor folks are expected to be grateful for that minimum wage job. and yet we feel the ceo “earned” his millions, and not the thousands of workers in the company who actually create the valuable products. misplaced priorities i guess.